Director Melee Hutton has selected the David French (of about 19 other interpretations) version for this year’s UTM arts faculty graduating class presentation. Each of the nine major portrayals are a challenge to interpret and thus direction needs to be focused and minute. Hutton obviously used the whip because every one of these personae are treated as fairly as is possible given the parameters of Chekov’s conception. Emotion must be as intense as the recitation and she’s managed to imbue her actors with this understanding and role comprehension. Irina Arkadina (I will omit the patronyms) is a selfish, miserly and so self-centered as to be a Kardashian. Think of the old saw “Enough about me; let’s talk about you…what do you think of ME”. Kyra Weichart brings an almost empathetic reading to this totally unpleasant woman who makes this writer almost change antipathy about certain individuals who epitomize the classification. She is kittenish; affectionate; cruel and totally uncaring all at the same time. Her affair of the moment is Boris Trigorin, a successful writer who kvetches about having to write! This scribe (me) has a half-century of churning out a few million words, each with a deadline – what’s his problem? Stuart Hefford’s interpretation almost grasps the semi-celeb status of an essayist but still seems unable to come to terms with it, manifesting in wrong social choices. Irina’s son Constantine is a playwright wannabe with a tortured psyche. He’s suicidal and thus another rationalization for my own discomfort with ‘Seagull’. My own occasional self-doubts are epitomized by Isaac Giles’s portrayal. His changing stance; body language and even sense of timing reflect his emotional roller-coastering. His uncle, Peter Sorin, is an aging invalid and Nathaniel Kinghan makes him into an almost sympathetic individual…almost; but still without any redeeming qualities. His country estate manager is Ilya and Connor Dutchak isn’t quite up to giving the role the dynamic it needs to contribute to the overall events on stage. His wife Polina is another story; Collette Fitzgerald is an epitomic Leona Helmsley, but without the requisite handbag doggie. Her facial expressions, especially spousal repugnance, are theatre at its best (worst?). Such a pretty face, such a miserable personality. Their daughter Masha (Sarah Kern) marries Semyon – a teacher; has his kid and yet still hankers for Constantine. She takes out this emotional contradiction by mistreating both the offspring and especially Nathaniel Voll as her continually humiliated husband. The play is an emotional downer, but the execution is theatre at its best. 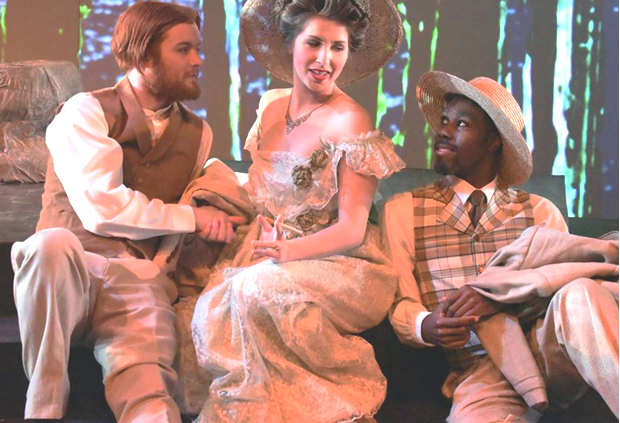 From direction to cast interpretations, to crew and technical; THE SEAGULL is certainly worth the trip to Mississauga. The birdie flies until March 20th. “Jekyll & Hyde; the Musical”, CCMP stages a hit.